Peplink’s AP Controller, a software-based AP management tool built into all Peplink Balance and selected Pepwave MAX routers, lets you manage your entire wireless network from your router. Peplink’s AP Controller works seamlessly with the AP One and AP Pro, providing advanced, enterprise AP management that’s plug-and-play easy. Setup is fast and access points are detected automatically, giving you immediate control over configuration, usage, and much more. You also get in-depth reporting that’s available 24/7 on all your devices, so you’re always up-to-date. 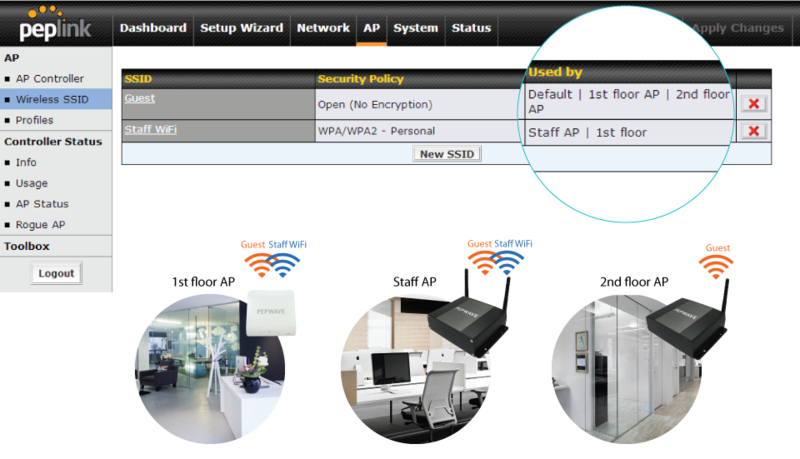 With the Peplink AP Controller’s array of included reports, detailed Wi-Fi network statistics are just a click away. Whether you’re working directly from your Balance router or on a tablet or smartphone halfway around the world, you get instant access to client statistics and data usage, broken down by access point, signal frequency, and time interval. The AP Controller also includes a client event log that gives you at-a-glance insight into user behavior, as well as alerts to events that require further investigation, such as suspected rogue access points. With Auto Provisioning, Peplink’s AP Controller can scan your network for new access points and configure them automatically. And it keeps an eye out for rogue access points and logs suspicious additions to your network, giving you extra peace of mind. You can even remotely push firmware updates to any or all of your access points.